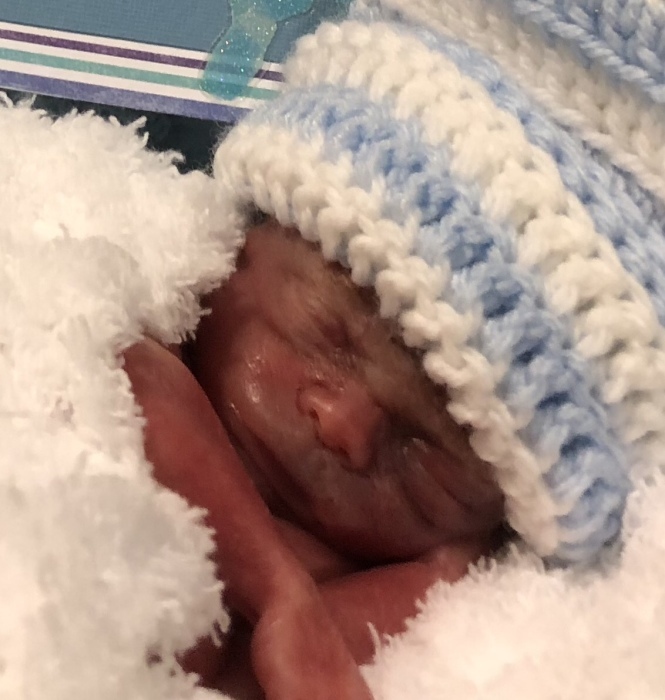 Anthony Kearns Davis was born perfect, but too soon, on November 12, 2018 at 2:59 a.m. at Mercy Health St. Rita’s Medical Center, Lima. During his short stay on earth, Anthony knew nothing but love. He was surrounded by his family and baptized into the Catholic faith before passing into God’s loving embrace at 4:15 a.m.
Anthony is survived by his parents, Kaitlynn E. Kantner and John-William T. Davis, of Wapakoneta; his loving sister, Jessalyn M. Davis; grandparents, Colette and Kelly Knutzen, of Wapakoneta, Gary and Patricia Davis, of Columbus, and Daniel Kantner, of Wapakoneta; great-grandmother, Joyce Anthony, of Wapakoneta; extended family, Bridgid and Robert Ray, of Columbus, Kevin and Sarah Davis, and their son Leo, of Columbus, Addie and Patrick Holsinger, and their children Hadley and Noah, of Columbus, Colleen Davis, and her son Davis Seaman, of Columbus, Jamie and Luke Bowersock, and their children Ava, Mia, and Emery, of New Albany, Eric and Ashley Sammetinger, and their children Amelia, Hans, Scarlett, and Clara, of Wapakoneta, Clayton and Valeria Kantner, and their son Skyler, of Loveland, and Logan and Kimberly Kantner, of Columbus; and his canine friend, Flynn Charles. He was welcomed into Heaven by his great-grandparents, Charles Anthony, Norman and Jean Kantner, Bill and Marian Davis, and Ula and Jack Kearns; a great-aunt, Kathy Davis; and cousin, Allie Sammetinger.